by Tom Banse Follow Northwest News Network Nov. 12, 2017 9:45 a.m. | Updated: Nov. 14, 2017 6:57 a.m. The rare but ever-present risk of a tsunami has worried people along the Pacific Northwest coast for years. Different communities are working on moving critical facilities to higher ground. 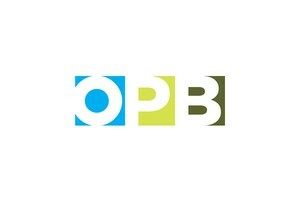 Years of talk and planning is turning to action this month at La Push, Washington. 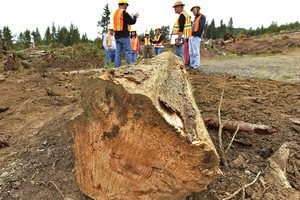 The Quileute Tribe has begun logging and road building to relocate its coastal village out of the tsunami and flood zone, starting with the Quileute Tribal School. Scrounging up money to move the rest of village will take many years. 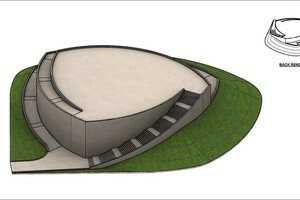 But the fact they’ve broken ground now makes tribal Councilmember James Jackson Sr. feel good. A special website created for the Quileute Tribe’s “Move to Higher Ground” project lays out the stakes starkly. “Relocating the tribal school to higher ground is truly a matter of life or death for the Quileute people,” it reads. It took an act of Congress in 2012 to make it possible for the loggers, truck drivers and dozer operators to go to work. The Quileutes lobbied to tweak the boundaries of Olympic National Park to add higher elevations to the then one square mile reservation. The reservation is surrounded by national park on three sides and the ocean on the fourth. The tribe says no residents in their small fishing village will be forced to relocate. Some elders in the lower village told me they support moving the school, but they personally intend to stay. Some marine-related businesses will also stay put such as marina facilities, a restaurant, the U.S. Coast Guard station and the tribally-owned Oceanside Resort. Project manager Susan Devine said the tribe’s priorities are to get children out of harm’s way first by moving the school, then the elders by relocating the senior center, and then government offices and housing. Devine said only the relocation of the tribal school is financed, thanks mostly to money from the U.S. Bureau of Indian Affairs that the Quileutes secured through a highly-competitive grant application. The tribe achieved a certain measure of celebrity over the past decade by virtue of being the home to a fictional band of werewolves in the bestselling Twilight vampire saga. The tribe leveraged that to get the attention of Congress, but the Twilight franchise hasn’t netted the Quileutes any money for their village relocation. The master plan for the new upper village in the Quileute “Move to Higher Ground” resembles a typical suburban development with functional clusters and houses on cul-de-sacs and looping roads across 278 acres. Right now, Quileute Tribal School Superintendent Mark Jacobson has a view to die for. He’d prefer that stay just as a figure of speech. Out his window, the waves crash on a majestic beach framed by craggy islands. Eagles periodically fly by. But invisible, just beyond the horizon, is the Cascadia earthquake fault. 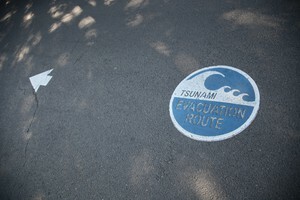 Geologists think it is primed to unleash a megaquake and tsunami. He said thinks about it every day. “Not a day goes by I don’t think about that because you don’t know when it’s coming,” Jacobson said. The future K-12 school campus is emerging from a second-growth forest at an elevation of 250 feet, well out of reach of the worst-case tsunami. Under the current schedule, the new tribal school should be ready to host the Class of 2020’s graduation. The Quileute Tribe is not alone is planning a move to safer ground. Down the coast, the main village of the Quinault Nation, Taholah, is similarly situated at a river mouth facing the ocean. The Quinaults have begun clearing land inland to relocate key buildings. 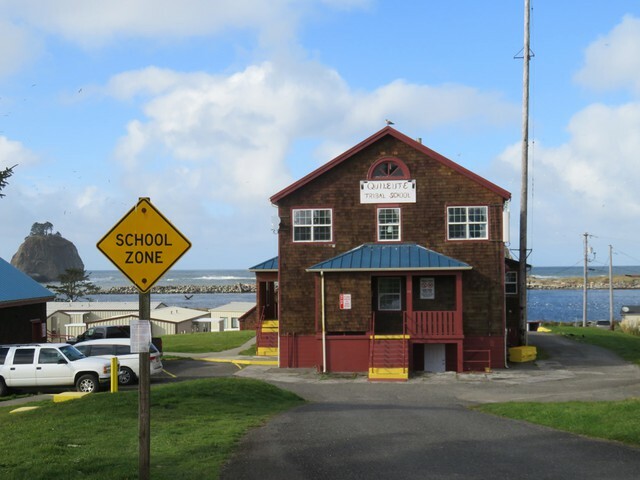 And in Oregon, voters in Seaside last year approved a bond measure to move three schools—Seaside High School, Broadway Middle School and Gearhart Elementary School—to a new campus out of the tsunami zone. Quinault Indian Nation Vice President Tyson Johnston said the Taholah village relocation plan could mark a milestone in 2019 with the opening of the Generations Building, which will host a daycare, elders program, Head Start and Quinault language program. “We’re not going to force anyone to move,” Johnston said, as is the case in La Push. But he said the tribal government would not permit new residential construction in the existing lower village, which lies in the tsunami and flood hazard zone. The cost to relocate the vulnerable village far exceeds the tribe’s resources, so again like the Quileutes, it is strategizing where it can turn.